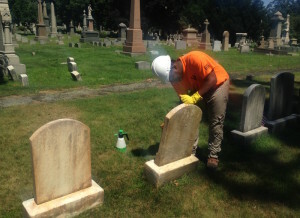 The ink barely dry on their diplomas, two members of WHSAD’s Class of 2015 were selected for participation in the Masonry Preservation Training Program at Bronx’s Woodlawn Cemetery. A partnership between Woodlawn, World Monuments Fund, and the International Masonry Institute, the 9-week summer training program offered Shechem Scatt and Teddy Espinal hands-on experience in the field of stonework restoration. At the conclusion of the summer program, Shechem was offered one of the two-year apprenticeships so he can continue his education in the field.